We’d love your help. Let us know what’s wrong with this preview of There's a Spiritual Solution to Every Problem by Wayne W. Dyer. To ask other readers questions about There's a Spiritual Solution to Every Problem, please sign up. Maybe it's just me, but I have a problem with people telling me how to live when it doesn't look like they can do what they suggest the rest of us should do. Let's take for example Dr. Wayne Dyer's There's a Spiritual Solution to Every Problem.' Wasn't there a spiritual solution to prevent any of his three marriages from ending in divorce? Or didn't he think divorce was a problem? I'm assuming he took the same vows all married people take, the ones that include 'Until death do us part.' Don't tho Maybe it's just me, but I have a problem with people telling me how to live when it doesn't look like they can do what they suggest the rest of us should do. Wayne Dyer leads the self-help brigade appearing on the highly regarded PBS channel. PBS, which stands for PUBLIC Broadcasting System means that your donations help fund his programs. In addition to what he gets paid to appear in the studio, he gets to promulgate his products during breaks in the program. "Abundance is not something we acquire. It is something we tune into," says Dr. Dyer. How we do that is something of a mystery. What is obvious, however, is that if you can write a fluffy inspirational book packed with maxims sans substance, you can make a bundle. Just open up and let the universe send you its abundance. "Successful people make money," he says. "It's not that people who make money become successful, but that successful people attract money. They bring success to what they do." Is money the only barometer of success? Does anyone really understand how to "attract money?" Doesn't that sound a little passive to you? If you want money, I always thought you had to work for it. But that concept isn't going to sell any books, tapes, CDs, DVDs, or tickets to speaking engagements. How much money do you think we spend for self-help advice? "Americans spend upward of $8 billion every year on self-help programs and products," says one industry expert. American pop psychology and pseudo spirituality is an industry that offers a quick fix to whatever ails us, but never actually delivers the payoff. One book, after another CD, after another DVD comes out restating essentially the same message: "If you follow my program, you'll achieve a life beyond your wildest dreams." I see a lot of people buying the products, but not many living a life beyond their wildest dreams. Am I saying that people like Dr. Dyer do more harm than good? Not necessarily. What I'm saying is that there's no quick fix, no shortcut to living the life of your dreams. It requires a little luck and a lot of hard work. No one can tell you the meaning of life. The purpose of your life is the purpose you give it. Don't rely on a self-help guru to neatly package a solution to your individual problems. That's your job. If you're successful, even if you never utter a word or write a book, how you live will speak volumes about you. I am beginning to believe that anything by Wayne Dyer is amazing, but I may be partial. I love his soothing voice, his wonderful sense of humor, and his brilliant messages. If you are struggling in any area of your life, or if you're having a great time and want ti to get even better, then you really shoudl consider this book. According to him, there are no problems in life. We create the problems. I had to listen to this part several times because it's difficult to grasp. Life doesn't have to b I am beginning to believe that anything by Wayne Dyer is amazing, but I may be partial. I love his soothing voice, his wonderful sense of humor, and his brilliant messages. If you are struggling in any area of your life, or if you're having a great time and want ti to get even better, then you really shoudl consider this book. According to him, there are no problems in life. We create the problems. I had to listen to this part several times because it's difficult to grasp. Life doesn't have to be struggle - we create our problems through our thoughts and how we react to things happening around us. (I'm also reading through Conversations With God - Book 3 and the message is synonymous with that of Dyer.) Nothing is real. Everything is an illusion. When we understand that we can let go of fear and doubt and negative thoughts and really start to LIVE the live that we were intended to. There was a segment in the move that was particularly intriguing to me. Dyer references a man by the name of David Hawkins, who performed kinesthetic tests on people using things that would be bad for your body and things that would be good (i.e. Sweet&Low artificial sweetener and natural vitamin C). He tested people's individual strength when one of these things was held by each person. Amazingly, each person appeared weaker in strength when holding the product of chemicals, and stronger when holding the item found naturally in nature. Dyer suggests reading Hawkins' book titled Power Vs. Force, which explores this in much greater detail. Nesa Exactly , its not about religion ( eventhough it sounds like) , its rather about aducating thoughts . One of my favorite books by Wayne Dyer! So sad to hear of his recent passing (Aug. 29, 2015). I've read this one a few times over the years and come away with something new every time. 1. All your conflict with others are never between you and them; They are between you and God. Love your body as the temple that God gave you to house your soul on this journey. 2. The empowering way is to view trials as lessons and opportunities to choose differently. 3. True abundance is an absolute knowing that everything you need will be supplied. 4. Give the world your spirit and detach from the outcome of your efforts and your energy field becomes less and less contaminated. 5. Every experience of sadness provides valuable lessons to learn and doors to open to higher spiritual awareness. Therefore, give thanks when such opportunities surface. 6. Joyful people rejoice in their strengths, talents, and powers and don’t compare themselves to anyone. Joy comes from rejoicing in all that you are, all that you have, all that you can be, and from knowing that you are divine, a piece of God. Finding joy means consciously deciding to process your life in ways that focus on gratefulness for what you have. 7. It is always about how you choose to process events, not the events themselves that determine your level of peace. 8. In the faster vibrational frequencies, you are able to invoke intuition, insight, and other potentials that are dormant when you are in ordinary human awareness. How you look upon the world and the images you have within you determine what you will get in your life. 9. Success: Highly successful people are those who have a knowing about resolving problems, and they are not focused on proving their point to anyone. 10. Passion – what successful people harden their will they become immune to outside forces which might attempt to dissuade them from their inner-passion. Burning desire to achieve inner objective. This book gives the reader hope to uncovering the solutions of the mind. I picked this book up to see what perspective Dyer would give me to help me feel at ease as I tackled those difficult times in life, and I felt so good as I read things I knew were true. Constantly working on keeping myself in a higher vibration is one way I am working on the prevention of life's challenges, but when they do hit me, I know that I just cannot give them energy. Practicing Dyers theories, has been time well sp This book gives the reader hope to uncovering the solutions of the mind. I picked this book up to see what perspective Dyer would give me to help me feel at ease as I tackled those difficult times in life, and I felt so good as I read things I knew were true. Constantly working on keeping myself in a higher vibration is one way I am working on the prevention of life's challenges, but when they do hit me, I know that I just cannot give them energy. Practicing Dyers theories, has been time well spent, as I am well on my way to a more peaceful life, which is precisely why I picked up this book in the first place. "Who are the people who seem to be able to push your buttons and send you into a frenzy? Your spouse? Your children? Your parents? A certain employee? Your boss? A neighbor? I'm talking about the ones who really seem to get to you. Anyone else might say the same thing and you are able to blissfully ignore them and even respond in your most spiritual and unconditionally loving tone, 'Thank you for sharing.' Obviously those people do not present any threat to your being an instrument of peace. It's those button pushers, the ones who succeed in sending you into a state of frustration and turmoil with a simple look of disapproval or a frown, who are your greatest teachers." Dyer as normal quotes others and recommends lots of books. One fact I didn't agree with but before I joined the LDS (Mormon) church believed is that there is no devil. He believes there is no devil so problems are thoughts. If you live in the now and connect with God (light)and keep away from dark all will be okay. I understand the theory of bad and darkness, as a dark bad feeling only I look at night with light as beautiful. I'm a morning person so I really don't go out much in the night but I w Dyer as normal quotes others and recommends lots of books. One fact I didn't agree with but before I joined the LDS (Mormon) church believed is that there is no devil. He believes there is no devil so problems are thoughts. If you live in the now and connect with God (light)and keep away from dark all will be okay. I understand the theory of bad and darkness, as a dark bad feeling only I look at night with light as beautiful. I'm a morning person so I really don't go out much in the night but I work at it to do so because it can be delightful with the correct mind set. To say I have read this book is not quite true. I have it in audiobook format and it lives in the deck of my car. I can't even say at this point in time how many times I have listened to it as it gets played often and has for many years now. What I will say for sure is that if you haven't read or listened to this book you are missing out. This was one of the very first spiritual books I ever read & it really turned my life around. Up until I read this book I didn't really think that happiness was a choice. I was always waiting for something or someone to make me happy. Dyer gives some spiritual advice for the most common problems people face. Enlightening yet practical I think everyone should have this book! This is an older book of Dyer's but no less relevant. For people interested in spirituality, I find Dyer extremely clear and well educated on spiritual teachings throughout the ages. His clarity of ideas makes a complex world simple. My favorite chapter is Stop giving energy to things you don't believe in. Now, of course, the practicing of the message is the continuation. Wish me luck! Well worth the time, and I did keep my highlighters and page flags handy and put them to use. Like all wisdom writings, it merely points in the right direction, but when the one pointing does so from a place of deep knowing, it can be truly helpful. What a source of inspiration this book gave me. It filters everything through unconditional love and offers so much peace and fulfillment. I have bought many copies of this book for others and will continue to do so. Please get a copy and read it. I have to be honest here and share my bias. I read all of Wayne Dyer's books and love them all, so I'm not necessarily well qualified to review them. I highly recommend ANY and ALL of his writings. His philosophy of life is a perfect match with mine. Now here is a guy who knows exactly what he is talking about! If you want to eliminate "problems" in your life, Wayne Dyer really does have the solution. Profound! Wayne dyer is a guru. I don't think a week goes by where I don't think of or apply, or teach someone else a lesson that he has taught me through his books, audio books and talks. Transformative. It doesn't matter what religious affiliation you may have, this book is universal. The only requirement is believing. I think it's his best book ever. It jump started my own development. I like Wayne Dyers books. They give a unique point of view. Wayne Dyer gives us spiritual tools when confronted with problems. He examines the Prayer of St. Francis of Assisi and shows how it can work in our lives. Một cuốn sách hay, tóm những điều căn bản. Nghe audio bằng tiếng pháp, chỉ nhớ 1 vài điểm chính hữu ích cho bản thân. Từ chối nhận xét của người về bản thân là trả cho họ quan điểm đó, nên chẳng có gì nên nghĩ ngợi thêm. Con người được tạo nên từ trường năng lượng, quan trọng nhất là giữ cho bản thân 1 trường năng lượng positive để luân chuyển tốt, tránh xa những gì làm xấu và trì trệ trường năng lượng của bản thân. Mọi thứ đều bắt nguồn từ tình yêu, hãy giữ tình yêu tràn ngập trong suy nghĩ. Sự gh Một cuốn sách hay, tóm những điều căn bản. Nghe audio bằng tiếng pháp, chỉ nhớ 1 vài điểm chính hữu ích cho bản thân. Mọi thứ đều bắt nguồn từ tình yêu, hãy giữ tình yêu tràn ngập trong suy nghĩ. Sự ghét là một dạng yêu bị sai lệch. Nên đặt tình yêu vào mọi chỗ để chuyển hoá những cảm xúc chưa tốt. Buồn, thất vọng, bắt nguồn từ sự mong mỏi những thứ chưa có được, thiếu tình yêu, tiền bạc, thời gian vv. According to the author, if it is permitted to paraphrase his argument, there's a spiritual solution to every problem, and that is to either pretend that it doesn't exist or to get away from it so that it does not disturb your inner peace or positive energy or to bombard it with love and positive energy until it disappears. Come to think of it, that's how I try to solve my interpersonal problems, but that is another subject for another time. According to this book's logic, that which is evil o According to the author, if it is permitted to paraphrase his argument, there's a spiritual solution to every problem, and that is to either pretend that it doesn't exist or to get away from it so that it does not disturb your inner peace or positive energy or to bombard it with love and positive energy until it disappears. Come to think of it, that's how I try to solve my interpersonal problems, but that is another subject for another time. According to this book's logic, that which is evil or fallen does not really exist, and so therefore this book and the arguments of this author do not exist either. But that is perhaps being too harsh to this author, since it is clear that the arguments of the author do exist, and the author's passionate invective against focusing on the negative or having attachment to the affairs of this world are themselves mere shadows, for writing a book where one seeks to critique others is certainly a matter of focusing on the negative, and if one did not really care about how others thought one would not go to the effort of trying to change opinions by writing a book such as this one. As is often the case when one takes a tour through New Age literature , the words and the actions simply fail to line up because the authors involved are so deep in denial about reality that they cannot even see themselves for who and what they are. Most of what is necessary to know about the book is present in its structure, which shows this slightly more than 250 page book divided into two roughly equal halves, the first half dealing with New age mystical principles derived from the yoga aphorisms of Patanjali, and the second half a rumination on a prayer of St. Francis of Assisi through the light of Buddhist-tinged New Age thought. There is a lot of discussion about one's aura and energy field, about low frequency and high frequency vibrations, about being at peace with oneself and owning all of the evil in the world and not seeking to place blame or responsibility on anyone else. Throughout the book there are a few scriptures cited, but they are cited without qualification, out of context, and often in service to beliefs so originally evil that they could have come straight out of Satan's arguments to Adam and Eve in the garden of Eden, including a denial that death exists, a claim that one needs to experience something in order to understand it that is told with an example of eating mangos, and a denial of the existence of evil and Satan whatsoever, and a claim that whatsoever one sets one's heart to one will find, as if God had no independent will or plan of His own but merely was a genie granting what was passionately desired by someone. The sheer diabolical nature of such arguments as this book has are surely not accidental, and they are likely not part of the design of the author himself, but rather the natural result of emptying one's mind, denying oneself the check of contrary opinions that comes when one shuts oneself off to criticism because of one's itching ears for false teachers, and believing oneself to be already pure and godlike rather than simply on a quest to become more like God. It would be too facile to state that this book was worthless, because its worth in reminding us that some aspects of the author's argument hold great appeal for people, and that this book and many like it are appeals to a type of pietism that serves those who spread evil in this world by discouraging that evildoers face any responsibility for their actions whatsoever. This is the sort of book that encourages the passive side of a satanic dialectic while those who are active in the support of evil and inflict that suffering upon others serve as the other side of that dialectic. This book does not have any call for justice, or any call for empathy or dealing with reality, but rather is a flight into illusion and self-deception, to pretend that evil and darkness do not exist so long as one has a powerful enough ability to deny the reality of life in a fallen world. To call this book or its author Pollyannaish is an insult to Pollyanna. Nevertheless, in a world where evil is so entrenched and so powerful, and where there is no desire to repent or turn one's heart to God and change one's own ways, this book's call to a life of fantasy and illusion and denying unpleasant reality is certainly appealing to many. That does not make it truth, but it also gives us an understanding at least of where some people are coming from and where some people live their lives in a flight from unhappy and unpleasant truths that would otherwise shake them to the core of their existence, and remind them that they are not eternal beings but are mortal beings with a short life and subject to eternal judgment for how they have lived their lives on this mortal plane. 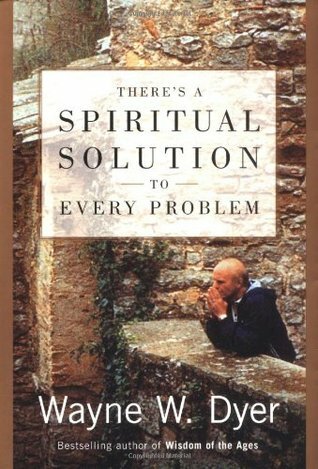 There's a spiritual solution to every problem, but it is not found in this book, or in any books like this one. E o carte foarte bine structurata si prezinta clar etapele si pasii spre a va simti mai liberi si mai light chiar si in furtuna vietii. Va face ordine in dezodinea mentala si spirituala. Veti gasi referinte si la alte carti, in paginile ei, carti ce merita citite. Wayne Walter Dyer was a popular American self-help advocate, author and lecturer. His 1976 book Your Erroneous Zones has sold over 30 million copies and is one of the best-selling books of all time. It is said to have "[brought] humanistic ideas to the masses". He received his D.Ed. degree in counseling from Wayne State University. He was a guidance counselor in Detroit at the high school level and Wayne Walter Dyer was a popular American self-help advocate, author and lecturer. His 1976 book Your Erroneous Zones has sold over 30 million copies and is one of the best-selling books of all time. It is said to have "[brought] humanistic ideas to the masses".